The C-54 was a military development of the DC-4 four-engine airliner, an aircraft designed for long range flights both within the US and overseas. These were to take the place of the flying boat. With the start of WWII, those DC-4s on the production line were converted to cargo/transport aircraft and given the military designation of C-54. They flew countless missions delivering high priority cargo and thanks to their carrying capability and long range were perfect for the Pacific Theater, where most of them were used. Hundreds were on hand at the end of the war and those that were not sold off soldiered on for many, many years until finally retired in the early-mid 1960s. A pretty good run for a WWII heavy transport. There is absolutely no difference in this kit and the DC-4 kit previously previewed other than the color of the plastic (this one being silver). So to save time and space, here is what I said about that kit. The kit bits pic is of the DC-4. Minicraft have basically taken over the airliner market with their many different aircraft kits. Some have been lambasted for inaccuracies here and there, but since I'm not an expert on these planes, they have all looked pretty good to me. This particular kit is molded in white plastic and has engraved detailing that is really way over scale, but it is what is expected from kits nowadays. There is no interior at all, which is not unexpected as many airliner/transport kit builders would rather use decals to represent the windows in this scale anyway. The cockpit section is clear plastic and includes the surrounding sheet metal so that fairing it in place is simple. Frankly, since they kit comes with cockpit window decals, I wonder why they bothered with the clear parts. 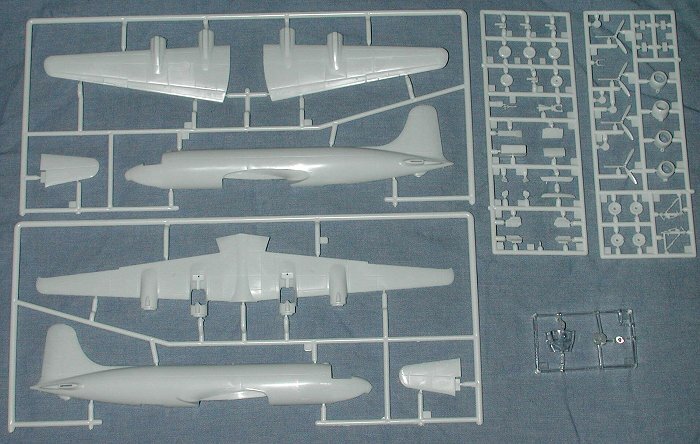 It would make molding much easier to just include those parts in the fuselage halves. All these tricycle landing gear propliners are going to be tail heavy so you'll need nose weight. The instructions recommend 3/4 ounce. Minicraft have molded the nose gear a bit more sturdily than the prototype would have been and that is good. I've built the Heller DC-6 and broken the nose gear a number of times. This thicker nose gear will help keep it intact. No wheel well detail is provided and the engines are just representations, but in this scale, that is more than adequate. There are nine construction steps, each of which really has minimal parts so that it seems to build rather quickly. Color information is provided in each of the construction steps as needed. A nice addition is that all the parts are named. There is also a parts diagram to help find those bits needed. Decals are provided for two planes. Both are in bare metal with black de-icer boots on the wings. Thankfully, these de-icer boots are provided as decals as are the grey areas for the wing walks. Th e two planes differ in their markings. One is the box art plane from MATS (later MAC and now AMC) circa early 1960's. From the same time frame is a USAFE Germany plane. One thing not shown is the underside of the aircraft so one has to assume the markings are the same there as on the top. The decals themselves are superbly printed by Cartograf. 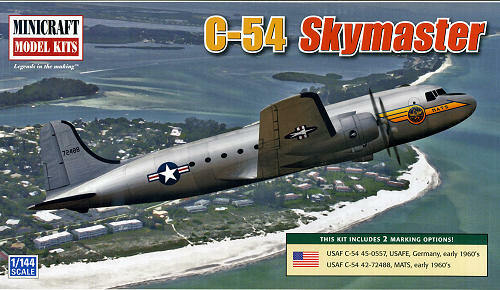 This is at least the fifth C-54 boxing done by Minicraft. In my untrained opinion, this is one of the best 1/144 Minicraft kits around. It is an interesting aircraft, the detailing is good, and a ton of them flew for decades with airlines, cargo companies and various military arms. What has surprised me has been the lack of military aftermarket sheets for this one. Regardless, it is a kit that once you start building it, you'll like it. You can find this and many other fine kits and accessories atwww.greatmodels.com.